Just tuned in to listen to Radio Kuwait in English in AM and found a DRM signal. The label just says DRM Service A, with a good signal level (average 22dB MER as measured by a Morphy Richards 27024) , 17.46 kbps, 4/64 QAM but no audio is decoding. 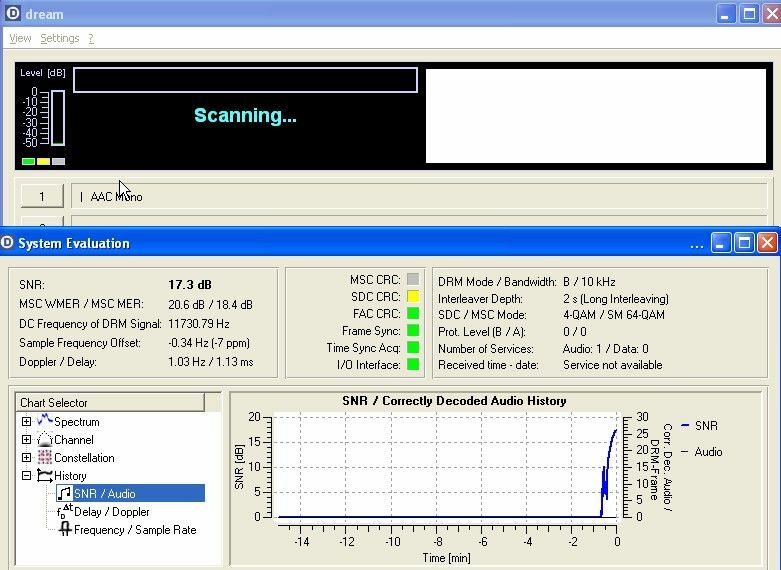 Radio Kuwait testing DRM? They were a major user years back. Apologies for mis-typed frequency on original post. 15540 KHz - 1800-2100 UTC? I heard it at 18.30 UTC, still operating at 20.25 UTC. There is something going on on 15540 kHz just now at 1808 UTC, 0 kbps (=no audio present), B/10 kHz, 4/64, P0/0. SNR hovers around 23-24 dB. SDC is yellow in DReaM V1.6.1. I am at work where I have only my little Grundig YB400PE. I can hear a solid DRM-like hiss on 15540 at 1815 - 1820 UTC Thursday 13/7/17. 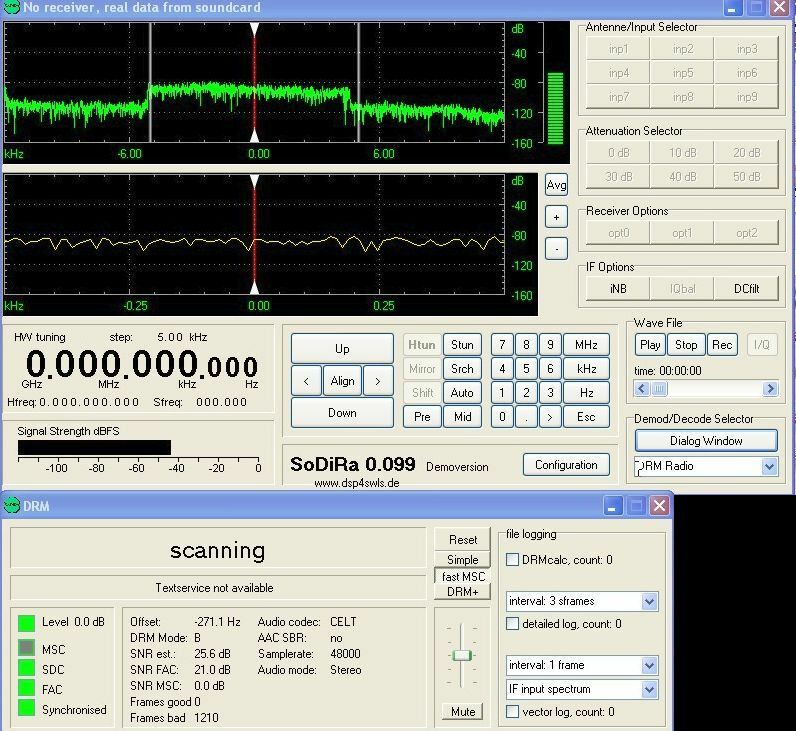 Twente's SDR shows it quite clearly, by the way. It is visible on kiwisdr.ve6slp.ca too at 1843 UTC. The signal in Stockholm is about 28-32 dBuv. The QRG is normally allocated to Kuwait between 18-21 UTC. I received this transmission. After several attempts to run the TX finally made it. The signal was strong 60 - 70 dBuV, the label box was empty, no audio but 36.8 dB max SNR...(In the 1st plot the mode parameters are displayed). 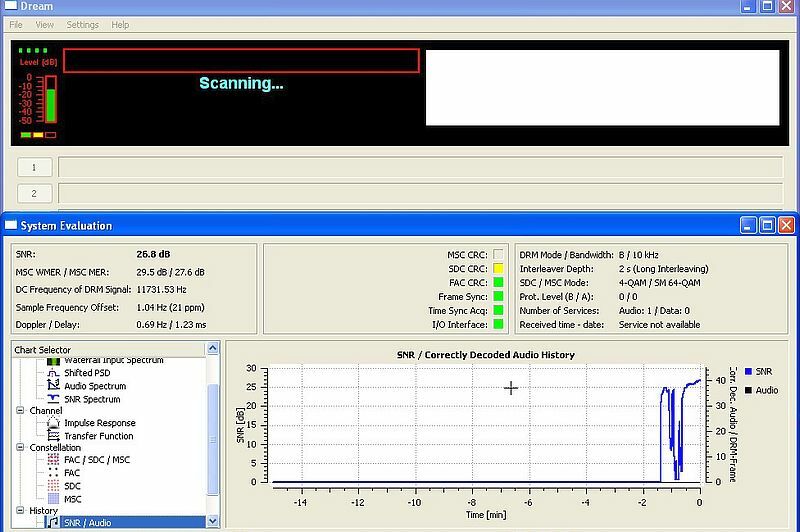 The DRM_Software_Radio displays something peculiar, take a look at the screenshot. EDIT: SoDIRA displays that the Audio Codec is: CELT. Buy a Gospell GR-216 and listen to the English transmission from Kuwait! The RF signal has decreased a lot over the last 30 minutes here so I'll listen in again tomorrow. 16.8db SNR here, but still only 4 green lights and no ID as yet. They've recently returned to Shortwave after having a new TX installed (by Ampegon I think), and have been putting a good AM signal in on 15540 since they came back on again. I'll try it a bit earlier tomorrow, the Bulgarian DX Blog shows it as 1800 to 2100 UTC. My log with Dream. The signal died due to poor propagation later in the evening. Tonight you can log Kuwait with DReaM. Log later. @ Alan: I think they used the xHE-AAC mode last night. Coming in well at the moment and giving very good audio. The signal strength isn't much different to what it was last night, so it looks like they might have changed something.